A stalwart of the high-street beauty scene, No7 has been making reliable skincare formulations that can be found in bathroom cabinets up and down the country for years now. No, it's not the flashiest or most gimmicky brand around, but you know where you stand with it. Considering No7 uses only the most cutting-edge technology and ingredients, and has the clinical data to back up every last claim, it's pretty serious skincare indeed. In fact, it just got a whole lot more serious, having recently launched a new range, No7 Laboratories, a line of slightly pricier but more potent targeted products for ultra-specific skin concerns. Unlike your favourite do-it-all cream, the No7 Laboratories products "single-mindedly target very specific skin concerns that transform the skin very quickly," explains Mike Bell, PhD, No7's skincare scientific advisor. Consider it souped-up skincare. The first skin concern in its sights? 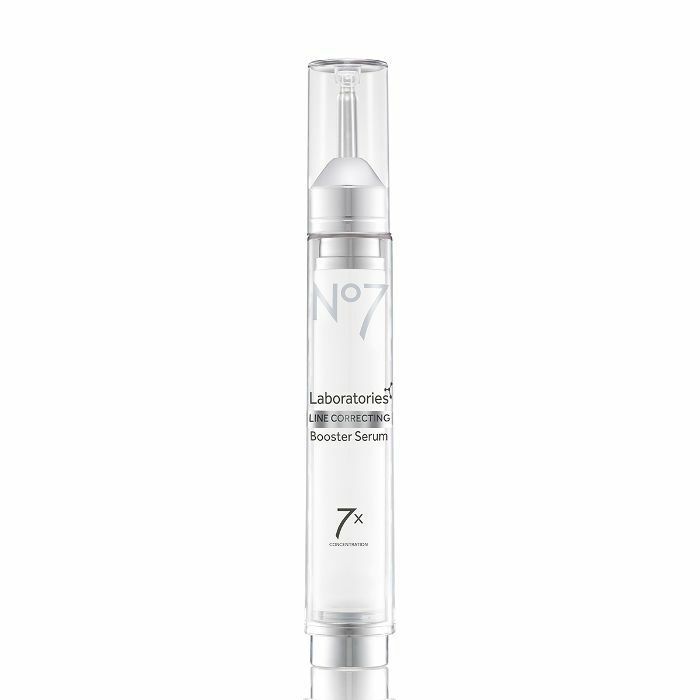 Fine lines, and it's found a pretty powerful solution in the form of No7 Laboratories Line Correcting Booster Serum (£38). Like a mini grouter for the lines that set themselves down on the face, the serum has a super-tiny nib that allows precise application so you needn't waste precious product on areas that don't require any assistance. But really, it's inside the tube where all the genius lies. It contains Matrixyl 3000 Plus (yes, it's a ridiculously flashy name that sounds more like a car than a skincare ingredient), which is basically a blend of peptides that helps rebuild stores of the things skin starts to lose—things like elastic fibrillin, the substance that gives skin its bounce and dexterity. "I think about fibrillin as like the springs that hold up the mattress of the skin, and we know that we start to lose them very early on in the ageing process, as young as 20 years old," explains Bell. This serum contains seven times as much Matrixyl 3000 Plus as any of the brand's other serums, making it No7's strongest defence against fine lines yet. "The serum is designed to target six zones of the face: crow's-feet, under eyes, frown lines, forehead, the mouth and nasolabial folds—those lines that go from the corner of the nose down to the corner of the mouth," says Bell. And so that's exactly where you should apply it, dotting it on and patting it in. It's super silky, so it's a joy to apply. For the new Laboratories range, the brand wasn't going to launch a new product without watertight clinical studies to back up its claims. The trials on this product proved the serum has the ability to reduce the look of fine lines by five years after just 12 weeks of use. But more than just scientific data, the brand wanted to find out the more visceral reactions of women using it. They asked both women who were considering Botox and those who had already taken the plunge to test the serum out: 73% of those considering Botox said they would be less likely to opt for the procedure after having seen what results the serum could provide after two months of use. And for those who had already experienced the line-ironing power of the needle, again, 73% said they'd delay their next treatment in favour of the skincare approach. Of course, the decision to opt for injectables like botulinium toxin is yours and yours alone, but perhaps this could be the cheaper, less invasive option to try first. I'm sure as hell going to put it to work on my forehead lines ASAP.